Headline news in a small town. I drove down that country road fast. The principal informed me that I needed to get to school immediately. It was the end of a good teaching day, and I was happy to be returning home in time to get my kids to practice on time. There would be no practice that night. I parked my car in front of the beautiful building and determinedly walked inside. My outer appearance was calm, but my insides were liquid stress, moments away from explosive diarrhea. What I learned in the next hour would rock my world. Never, in my wildest dreams would I have thought that school would be the location of my child’s worst decision. My kid. My child. My baby. In the subsequent months, I rode a rollercoaster of emotions. It was like the stages of grief: shock, anger, despair, acceptance, loss, etc. My husband and I went into Operation WTF, quickly consulting professionals. I realized that my chair at the dinner table was positioned far away from her. Angry and ashamed, I could not separate her misdeed with my ego, so I pushed her away. Two moms reached out via text and instant message. I will be forever grateful for their kindness. I knew my kid was a social pariah, but they offered love to our family and me. Everyone knows what she did. It is public; the shaming will be like the Scarlet Letter. I held onto my anger and dismay until I saw my child face her first Judas. I watched how her friend whispered in the ear of another teammate, increasing the number of her peers who knew. My daughter handled it well. It is like she was writing a mental list of trustworthy individuals. Her armor reinforced with each former friend’s rejection. Oddly, I was both proud and devastated. Proud that she was learning and growing. Proud that she had taken responsibility. Proud that she was reflective. Devastated because her choice was so outside of her character. Worried that I had lost my daughter to the dangers of the world in a location where she was supposedly safely nurtured: her safe, rural middle school. Why my kid? I am a teacher — a high school teacher — an expert in adolescent development. How had I missed the elephant in the room? What did I not say or do? What key instruction had I left out? Why did I not see the signs? I thought her father and I had been open and communicative, but her actions were unanticipated. It felt like a sucker punch. Her character will be questioned. Good girls don’t…. However, she is a good person. She is a responsible, conscientious student. Thirteen-year-old people are exceedingly impulsive, dramatic, and blatantly lacking in forethought. Why does it take so long for that frontal lobe to develop? How unfair is it that our children can make adult decisions before the onset of adulthood? They cannot legally drive, drink, or vote, but their actions can lead to very grown-up consequences. To keep sane, I self-talked: This tribulation will make her wiser. We will grow as a family. She will always have an example of her parents’ unconditional support. She will battle, and we will give her armor. The way home is through Baghdad! Excellent question, but lacking in emotional logic: my students are not really mine. They are on my roster briefly. I did not carry them in my body and carefully decorate their rooms. I have not cut off the crusts of their sandwiches and held them when they were ill. I have hopes and expectations for my students, but for my daughter, I have dreams and visions. Ultimately, I have a duty to my students, but I have a responsibility to my child. I was a teacher for ten years before becoming a parent. Many times I have put my job before my family. Ironically, my job separates me from my children so much that I feel like I am guiding other’s people’s children better than my own. At the end of a teaching day, I have very little remaining for my offspring. It is exhausting to be “on” all day long. “Teacher’s kid gets suspended.” Yup. She did. It is true. Teacher’s kids are human too. Teacher’s kids are not immune to bad decisions and uncomfortable situations. Teacher’s kids are extensions of the local celebrity of their teacher parent’s status. Teacher’s kids are often held to impossibly high standards, especially by their parents. So how does a teacher overcome the guilt and shame of her child making mistakes, especially very public transgressions? 1. Hide, but not for too long. After seeing one horrible post on Facebook about my daughter, I went into a social media blackout. I did not return calls and texts. I stopped writing for publication. Although strangers know what my child did, my closest family and friends remain in the dark. We will not tell our most cherished people because our daughter needs them to be ignorant. Exposed in her small town world, she deserves sanctuaries in other dear relationships. 2. Take out a baby picture of your kid. I found a picture of my daughter taken on her first day home from the hospital. Looking at the picture, reminded me of the hopes and the enthusiasm I had as a new parent. “She is my baby,” became a mantra. Yes, it will make your busy life more stressful. Yes, it will shine a light on your fault lines in your marriage, and in your parenting. 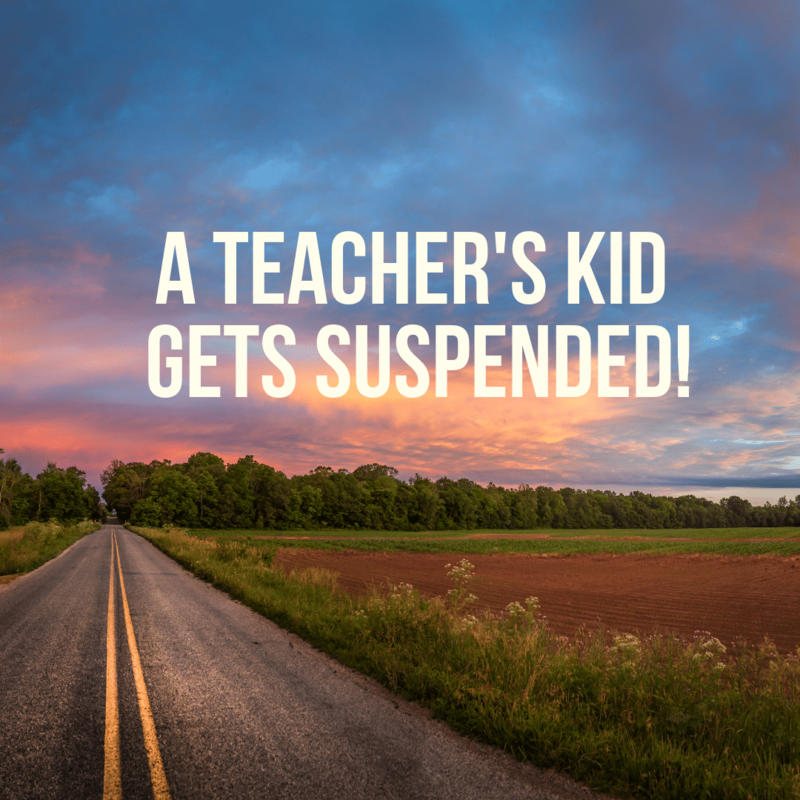 However, when your kid gets suspended and is guilty of wrongdoing, you must explore the reasons. Without professional help, the problems will only increase and most likely morph into different areas. Showing up is the hardest step and where parenting gets real. Your child needs to return to school and face the biggest mistake of her young life. You need to ask yourself if your anger and disappointment is more important than showing up for your kid? You will need to set aside the shame and go to the sports practices and other activities. Although you will not feel enthusiasm, you will still need to cheer. You will realize that by showing up for your kid, you become the wall that they swim to — you will be the constant in the storm that is adolescence. Slowly. Your child will be asked to be social again. Friends will want to be in your family’s life still. From now on, people you encounter will be separated into those who know, those who don’t know, and those who pretend not to know. Protect yourself, your kid, and your entire family. Be careful. Trust your gut. There is always more to any incident. Rumors swim in a sea of untold backstories. Encourage your child to find someone that they can trust to tell their account. Find someone who will bear witness to your grief as well. And when people say you that you are not alone, please believe them.